Successfully Added USB-A to USB-C Charger Cable - 100CM Lenght, Magnetic Removable USB Type-C Interface, 2.4A Power, High Speed Data Transfers to your Shopping Cart. This 100cm cable features a regular USB type A connector at one end while, at the other end, holding a USB Type-C connector. Perfect for all of you who like to charge their latest gadgets or transfer data in between different electronic devices. This little electronic accessory supports 2.4A fast charging and provides you with the perfect cable that supports high-speed data transfers and quick electronic charging sessions. With this USB-A to USB-C charger cable, you will be able to conveniently charge your USB-C device as well as sync your photos, music, data, and more to your existing laptop. 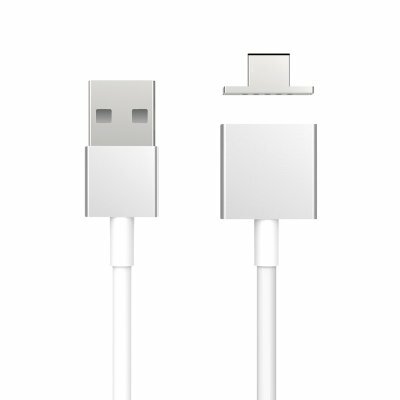 Featuring a magnetic tip the USB Type-C connector can be easily detached from the cable and, if necessary, replaced with another charger type. (Not Included) This makes this electronic gadget the perfect little accessory that offers a convenient way to transfer files and to charge any type of electronic devices without any further hassle. This USB-A to USB-C charger cable comes with a 12 months warranty, brought to you by the leader in electronic devices as well as wholesale electronic gadgets..
Arabic: - كبل USB-ج شاحن - Chinese Simplified: - C USB 充电器电缆 - Czech: - USB-C nabíjecí kabel - Dutch: - USB-C laadkabel - French: - Câble chargeur USB-C - German: - USB-C Ladekabel - Hebrew: - כבל USB-C מטען - Hindi: - USB-C अभियोक्ता केबल - Hungarian: - USB-C töltő kábel - Italian: - Cavo di ricarica USB-C - Japanese: - USB C 充電ケーブル - Korean: - USB-C 충전기 케이블 - Malay: - Kabel pengecas USB-C - Norwegian Bokmål: - USB-C ladekabelen - Romanian: - Cablu USB-C încărcător - Russian: - Кабель зарядного устройства USB-C - Spanish: - Cable cargador USB-C - Thai: - สายชาร์จ USB-C - Turkish: - USB-C şarj kablosu - Vietnamese: - Cáp sạc USB-C.